World War I and World War II so transformed the maps of both Europe and Asia that discerning the influence of antecedent conflicts like the Russo-Japanese War can be hard. Still, the setback that the Japanese dealt to the Russians in 1904-05 helped shape the contours of Asian politics for a century. Surprisingly, given the relative backwardness of the Russian and Japanese economies in 1905, it also served as the world’s first taste of modern, industrial warfare. The Russo-Japanese War commenced over 100 years ago, lasting eighteen months before a US-brokered truce mercifully put it to rest. The war killed upwards of 125,000 people, and sharply limited Russian influence in Northeast Asia. Japan gained control of Korea, and gained a long-term foothold for influencing events in Manchuria and China. Writers have ascribed many legacies to the conflict, some of which we can set aside. Victory against Japan probably would not have prevented the collapse of Imperial Russia and the founding of the Soviet Union; the Revolution happened for other reasons. Moreover, the conflict did not give the Central Powers a “window of opportunity” for defeating Russia in Europe; we now know that Vienna and Berlin over-estimated, rather than under-estimated, Russian power in 1914. Defeat might conceivably have broken Japanese militarism for a time, but the weakness of China and of the European colonial empires would likely have proven too tempting for Tokyo in any case. Still, the Russo-Japanese War may indeed have been a “regional” conflict, but Northeast Asia is a remarkably important region, home to three of the largest economies of the 21st century. The war set the terms upon which Russia, China, Korea, and Japan would contest control of the region over the course of the 20th century. The conflict also had important legacies for the conduct of war. The power of conscript and rapid fire weapons would prefigure the experience of 20th century land combat, while fighting between “castles of steel,” would lend key lessons for naval planners in both World Wars. The waning power of the Qing dynasty in the 19th century set the state for Russo-Japanese conflict in Northeast Asia. Although Japanese success at sea was not replicated to the same extent on land, the Japanese victory did place stark limits on the extent of Russian power in the Pacific. Even after the Soviets won a decisive victory over Japan at Khalkin Gol, and crushed the Kwantung Army in the waning days of World War II, circumstances prevented permanent territorial aggrandizement. Had the Russians maintained their position in Asia in 1905, this might have turned out much differently. With the collapse of the Qing Dynasty in 1911, and the ensuing collapse of the Chinese state, China was unable to resist foreign encroachments upon its territory. Fortunately for China, Russia remained in such disorder that it could not take advantage to its own territorial aggrandizement, and in any case Japanese power held Russia in check. Japan, however, took advantage of Chinese disorder. In 1931 the Japanese Kwantung Army occupied Manchuria and declared it independent of China, installing the last emperor of the Qing dynasty in what became Manchukuo. Neither Communist nor Nationalist Chinese forces had the strength the contest this move, but the Soviet invasion of August 1945 quickly annihilated the Kwantung Army. Rather than maintain Manchukuo as a Soviet satellite, the Russians looted in, then used it to bolster the position of the People’s Liberation Army. In 1949, the Chinese Communist Party took control of most of China, including Manchuria but not including either Taiwan or Mongolia. Had Russia prevailed in 1905, then either Russia or the Soviet Union, instead of Japan, might well have detached Manchuria, just as the Soviets detached Mongolia. Under such circumstances, it’s unlikely that any Chinese government would have been able to recover the territory; the Soviet Union was in no mood for reparations in 1945. Whether incorporated directly into Russia or simply into the Soviet sphere, Manchuria might now remain politically separated from the rest of China. Conversely, a Korea more capable of playing Russian influence off Japanese might have been able to retain its independence. Of course, much remains unknowable. A defeated Japan might have taken advantage of the opportunity provided by the collapse of the Russian Empire in 1918 to seize what it could not take in 1904. Even this, however, might have produced a different configuration of power in Northeast Asia than eventually held. 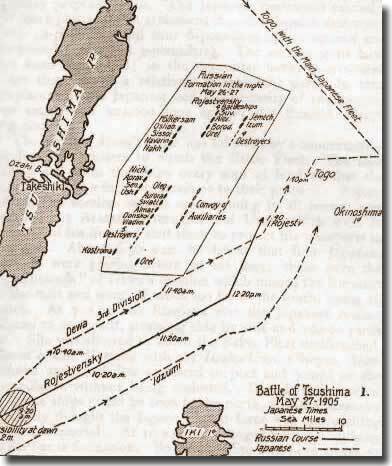 Fought in late May, 1905, the Battle of Tsushima remains the great battle of annihilation of the steam age, and possibly the single greatest naval victory of all time. Admiral Heihachiro Togo’s decision to offer battle at Tsushima remains an unremarked-upon curiosity. The Russian fleet was, in numbers, considerably superior to the Japanese, and in the technology of its most advanced ships qualitatively equal. The first rate Russian battleships were of modern design, and the Russian 12” gun well regarded, even at long ranges. To be sure, Togo had major advantages. His ships were well drilled, and his sailors in top condition. The Russian squadron had endured a series of traumatic adventures in its interminable journey around Eurasia, and wasn’t in fighting shape. Nevertheless, offering battle represented a real risk. A single well-placed shot could have destroyed one of Togo’s battleships, probably tipping the result inexorably in the Russian favor. Moreover, it’s unclear what precisely the Russian fleet could have done to change the verdict of the war. The geographic situation strongly favored Japan, as the Russian fleet could only disrupt communications if it deployed in force; otherwise, Togo could destroy it piecemeal. The Russians could have raided Japan or harassed the Japanese fishing fleet, but without a proximate base could neither have forced battle nor prevented Japan from supplying and augmenting its fielded forces on the mainland. Nevertheless, Togo forced battle on the exhausted Russian fleet, and used two major advantages to great effect. The speed and coherence of the Japanese line allowed it to conduct what has become known as the “Togo Turn,” a maneuver which crossed the Russian “T” and effectively allowed the Japanese to double up on the lead Russian warships. The most powerful Russian battleships were destroyed in echelon, while the Japanese tracked down most of the escapees the next day. In addition to its military impact, the victory had a great morale effect, serving as an international signal of Japan’s prowess, and Russia’s decay. The defeated Russian admiral was treated as a hero by opponents of the Czar, who argued that the corrupt, incompetent Russian government had needlessly sent thousands of brave young men to their deaths. Whatever its effect on the war, Tsushima was enormously influential abroad. In the short term, this accelerated the trend towards fast, all-big-gun battleships. In the longer term, it helped ensconce the idea of a single, decisive battle in the minds of naval theorists and practitioners. A concentrated Japanese fleet had prevailed over a concentrated Russian fleet through superior tactics and training, completely destroying the latter in the process. The victory left Russia effectively without maritime recourse, no longer in a position to threaten Japanese communications with the mainland. This is the victory that Jellicoe and Scheer sought at Jutland, and the victory that the admirals of the IJN wanted to inflict on the battleships of the U.S. Navy in the Second World War. Conversely, it was the defeat that the Italians desperately wanted to avoid in the central Mediterranean, and that the British feared off the Falklands. Tsushima, combined with a bastardized form of Mahanianism, influenced naval thought for generations, and remains important today. Most historical analysis of the Russo-Japanese War has focused on naval heroics, with the Battle of Tsushima taking a central place. In many ways, however, the legacy of the land war has proven more enduring. The transformative effect of military technology on the land warfare slowly became apparent across the nineteenth century. The Crimean War, the American Civil War, and the Franco-Prussian War were all “transitional” wars, progressive steps from the (graduated) plateau of eighteenth century infantry combat to the plateau of “modern system” combat. Land combat between Russian and Japanese forces in 1904 and 1905 was recognizably modern. Although the airplane would not have an impact until the next decade, most of the pieces associated with the 20th century “Revolution in Military Affairs” were set in place. Most notably, this included the combination of mass, conscript armies with the advent of modern, rapid-fire weapons that could effectively clear the field, leading to the phenomenon of the “empty battlefield.” Armies have struggled to solve the problem of the empty battlefield since 1905, developing a cascade of innovations, from trenches, to tanks, to sophisticated artillery barrages, to storm troopers, to (in their own way) strategic bombers. The Battle of Yalu River, the Siege of Port Arthur, and the Battle of Sendepu differ from 20th century land combat only in emphasis. Both Japanese and Russian forces suffered enormous casualties in efforts to take prepared defenses. The Battle of Mukden, fought in March 1905, produced a total of nearly 150,000 casualties. To be sure, much has changed; the advent of the aircraft and the widespread use of the radio would change the means of land combat within fifteen years of the Russo-Japanese War. Still, the forms of battle are essentially recognizable, in a way that the battles of the American Civil War are not. Image Credit: Creative Commons 3.0.